These past days I've been having a lot of signs pointing me to - joy. Yes, joy. Not productivtiy, success or money, but joy. I listened to a TED talk by Ingrid Fetell Lee about what things gave us joy, I heard Brendon Burchard (love him!) talk about how you should actually demand joy and I also heard Alexander Heyne, the author of Modern Halth Monk channel talk about manifesting and how things that got him excited (which is akin to joy) also got viral. Ingrid Fetell Lee talked about how round objects, bright colors and multitude of things/abundance (things like baloons, bubbles, cherry blossoms, confetti) made people feel joyful. Do you agree, do these kind of thing give you joyful feelings? Around that time I also made small pink pancakes and posted them to my Instagram. I realized they're round, brighly colored and there's a whole stack of them! 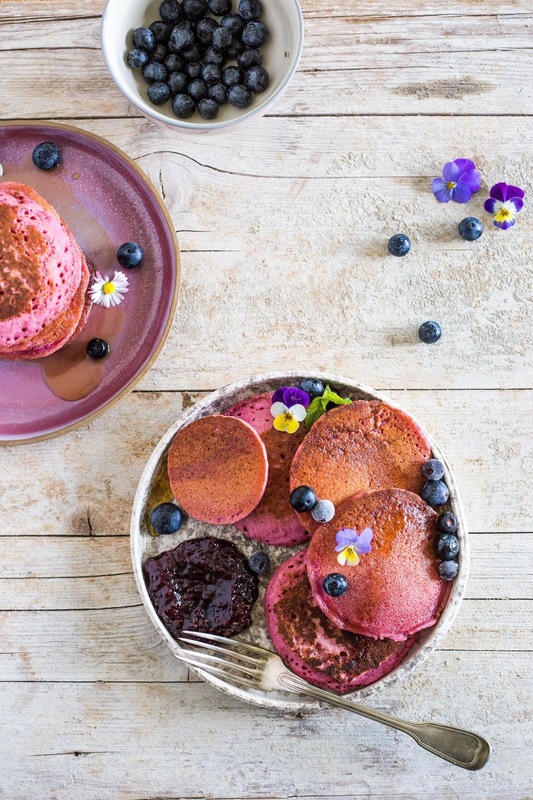 oh joyful pink pancakes! They're also vegan! So here is the recipe, in case you want to bring more joy to your table. Mix the first four ingredients in a blender to make something of a pink smoothie. Add the rest of ingredients and blend/pulse just long enough to incorporate. Do not overmix or you'll get gummy pancakes. Cook on a lightly oiled non-stick pan on medium heat, about 3 minutes on one side, then flip and cook for 2 more minutes. Serve warm with lots of fresh fruit (berries go superbly well with these! ), drenched in mapple syrup. They also freeze well, so you can store them for a breakfast in a hurry. Do you love pink food as much as I do? And how do you feel about joy? Do you experience a lot of it or could you have more of it in your life? 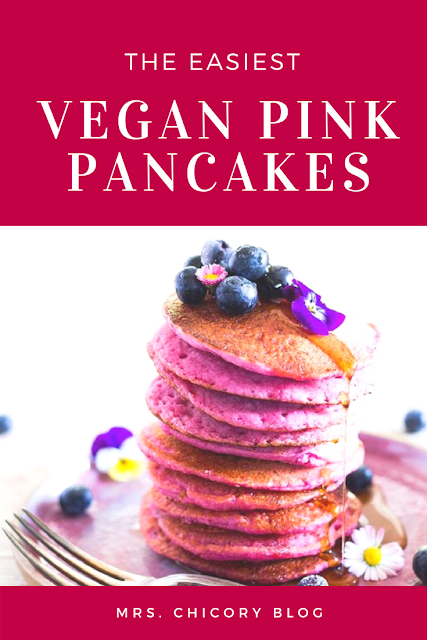 Would you try these vegan pink pancakes? Pin them for your next sunday morning! Oh, yes... 'a vibrant pink color'. Sounds and see good. Better. The best.